I can't dump on the panel at all... I thought it was great what we saw that's new, and I'm actually excited about the hobby. Was there a Q&A? I figured that'd be the only thing people were truly pissed about. I don't see a break in figures for a while as a bad thing though. They're going full bore now for way too long. Breaks don't bother me as much as they maybe once did. Yeah, but it was lame: Why did Jet take a long time; [little kid asked] why was the DS box set so hard to get; why no star cases for vintage at HTS; why so many different lines cw/tvc/legends. Well, people can't bust on the Q&A online anymore. I am hopeful that they actually do re-release figures from previously waves. I wonder what they mean by it though? What would they re-release? Two figures? Ten? Which ones? I am not that excited about one wave being exclusive to Wal-Mart but at least it's the biggest retailer in America. So, the chances are hopefully good at getting them. We'll see. I really liked the deleted scenes figures. I thought maybe they would end up being crappy or uninteresting. I guess they will make ones from the other films??? I enjoyed looking at the presentation today. Good stuff. Although I have been more impressed with Sideshows 12 inch offerings. That IG-88, Boba Fett, and Rainbow Battle Droids army looked great. I can't really afford any of it but they look fantastic! All this Phantom Menace stuff is actually making me a bit nostalgic. It's a pretty great line up, a good mix of old and new. I'll be looking forward to the lot of them. I also agree that it bodes really well for the future films 3D releases if we can get a small push like this based on each one, we'll have several holes filled in for each film by the end of the 3D run. Only guys in pink sweaters can do that... Duh. Sounds like they were only answering questions from planted crowd members. Honestly I don't know how anybody could be TPMed out... we've had what, 2 waves of figures featuring TPM characters since the end of POTJ? If anything, TPM is the movie we need the most from, and it looks like Hasbro is delivering. TPM seems to be getting a second wind with fans. It took a long time for people to get over the retail disaster that was Episode I. Retailers bought into that line SOOOOO heavily that it wound up being a regular fixture at retail for 3 - 4 years. And with the movie, people are only starting to warm up to Jar Jar some 10+ years later. And since we're now over 5 years past ROTS, I think fans are a little more ready to embrace the whole Prequel Trilogy with some level of nostalgia. From a toy standpoint, we really have seen such marked advances since 1999. The figure aesthetics of sculpt and articulation have come a long way, and I think there's a desire to get TPM characters done with a modern treatment. I remember how hot the first Darth Maul figure was back in 1999, but that figure has not held up. Hence the resculpts and newer versions. If the 3D re-releases go well, perhaps we'll see all the films get this kind of focused treatment from Hasbro. Sure most of them are dated, but some people make the old Episode 1 figures to be worse than they are, IMHO. There's few that are embarassing/awful as some of the early POTF2 releases or some of the later AOTC Saga era stuff. TPM was the only Prequel that felt like it got a real, as in old school Kenner era, toy line of its own. AOTC was a mess that didn't get its own packaging. ROTS was better, but was planned to end at the end of 2005, parts of its toy series felt rushed/half hearted. I agree - from my perspective, TPM toys in general and a lot of early 2000's toys get a lot of flack that I don't know is deserved. Good example is Skiff Guard Lando - the 2004 (?) one is actually very good. Ditto the General Lando. When the new version of the Skiff Guard was announced yesterday, I saw quite a few leaped on the idea of replacing the Saga one. Obviously this one is better - but I don't feel myself the last one is lacking. This goes to a lot of other figures, too, including some TPM and POTJ ones. A lot of those figures, the original Plo Koon, K-3PO, and on into the excellent Saga pieces (post AOTC) are still very good. I'd love one, but I don't see it happening. I think the closest thing anyone is going to get to a toy MTT is the Pepsi MTT cooler from back in 1999. Most all of TPM figures looked great to me that were shown. Now I can't tell on some of them because the pics were crap like Kenobi, Maul, and Jinn. I was pretty excited to see Vos getting made myself. Aurra Sing looked good, the Naboo pilots, Anakin, and yes my personal fav Ben Quadrinaros. Even though he pissed me off initially when I saw him in the films. 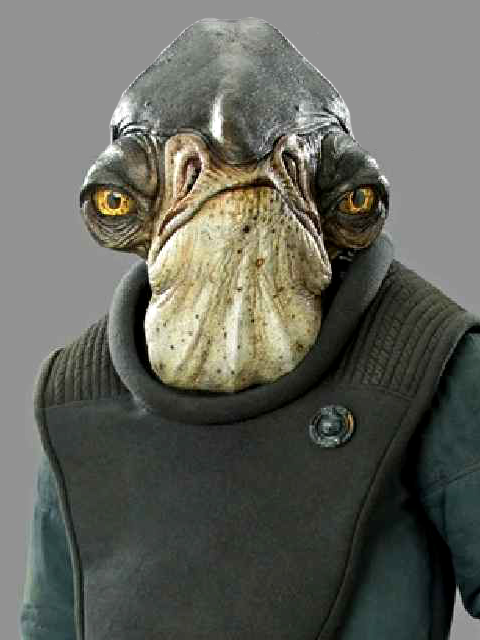 He is the most absurd alien design in the entire Saga and yet somehow Lucas approved him. LOL! His figure actually looks pretty damn great to me. Now, that does not mean I will rush out and buy up all TPM figures but I'll probably get several of them. Hell, even Daulty Dofine looks great! I am a bit miffed Dr Evazon is not coming out until later next year. I was really looking forward to putting him by Ponda Baba ASAP (assuming I can find him that is). I am assuming we are going to be getting more Deleted Scenes figures from the rest of the film in 2012? Maybe we'll find out when Hasbro goes to that New York con in October? Anyway, cool stuff I thought from Comic Con. I do prefer the OT thought so it's not as good as say last year but still good to gaze at. Again I can't believe the stuff coming out of Sideshow. I can't afford any of their stuff but crap some of their stuff was awesome - IG-88, Boba Fett, all the Battle Droid variations, environments, General Greivous, whew!